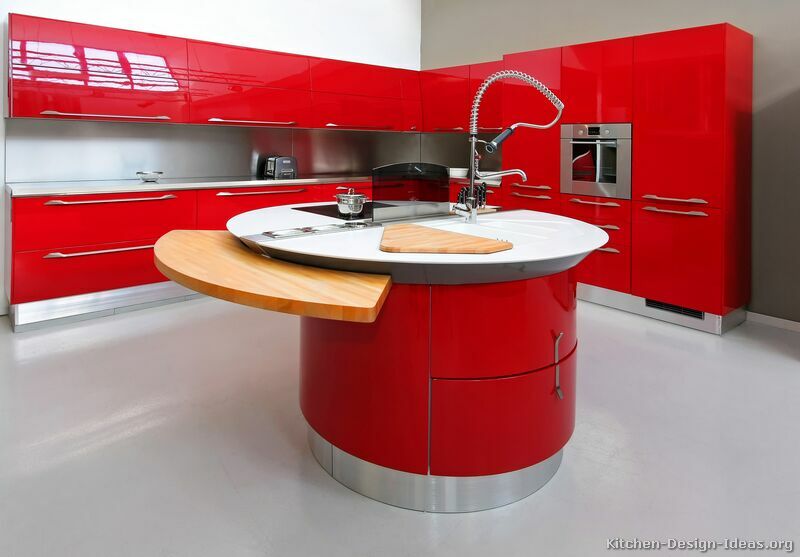 Red Kitchens: Nothing quite spells "look at me!" 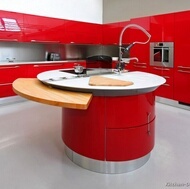 like the color red. 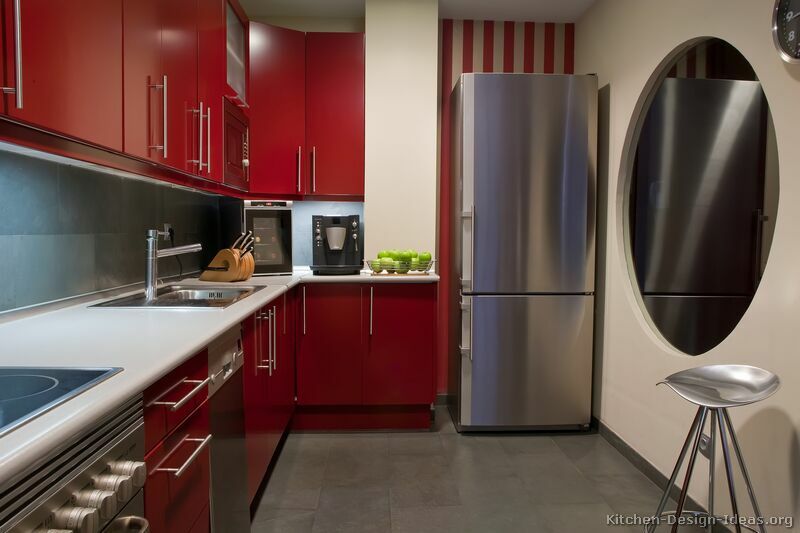 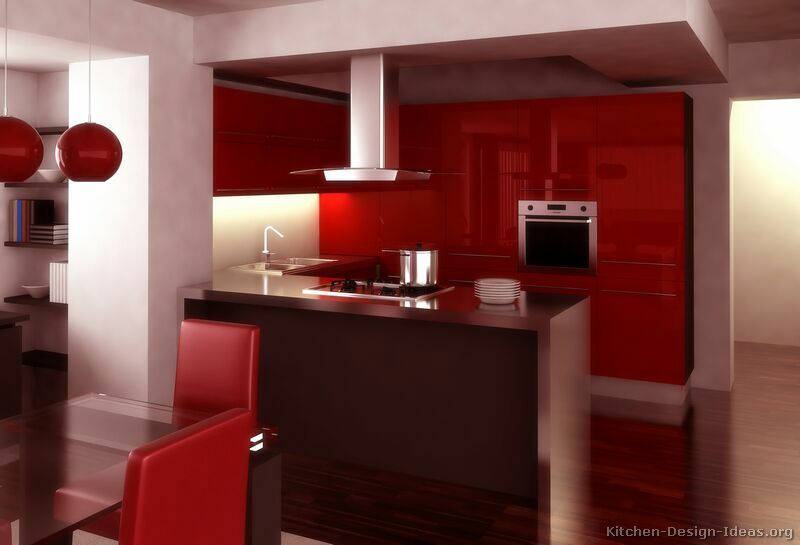 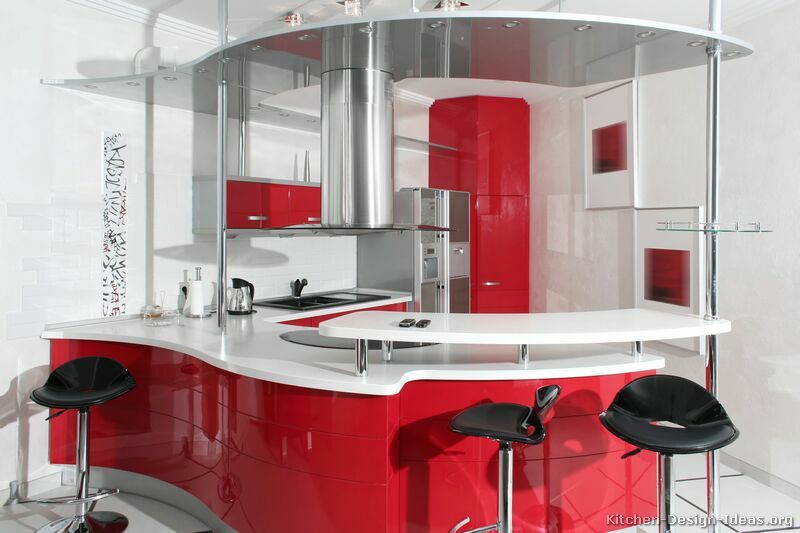 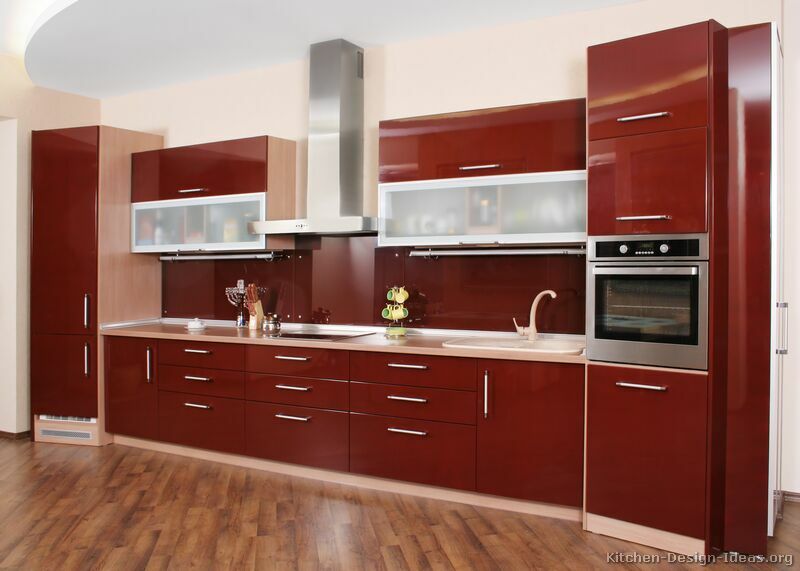 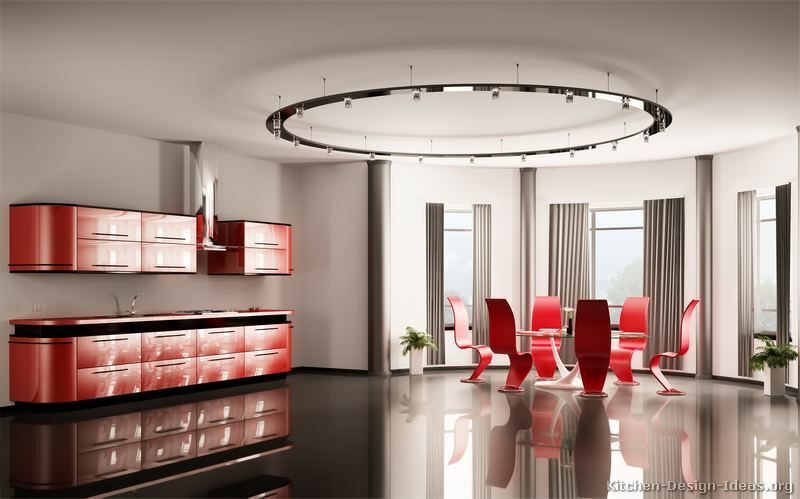 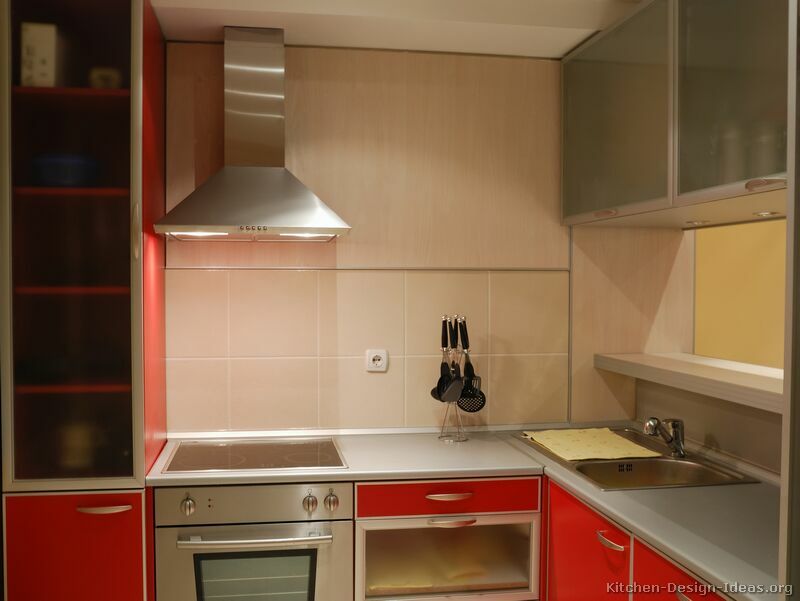 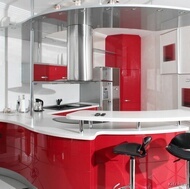 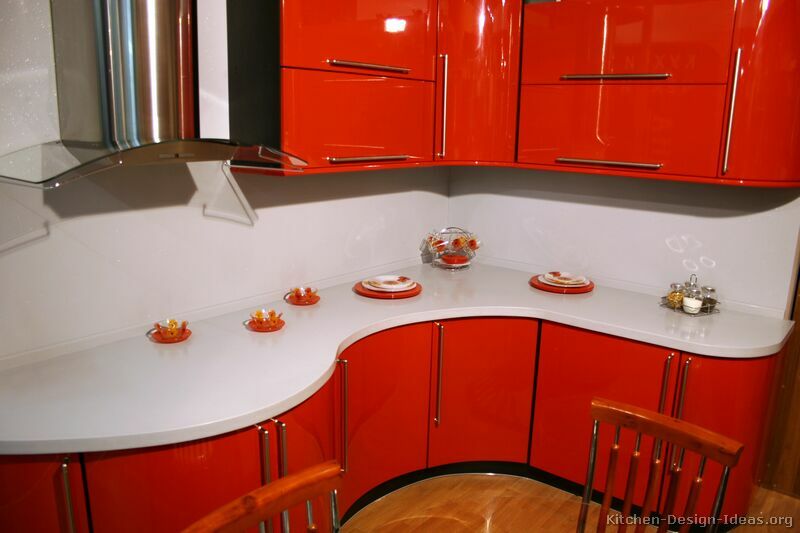 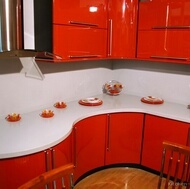 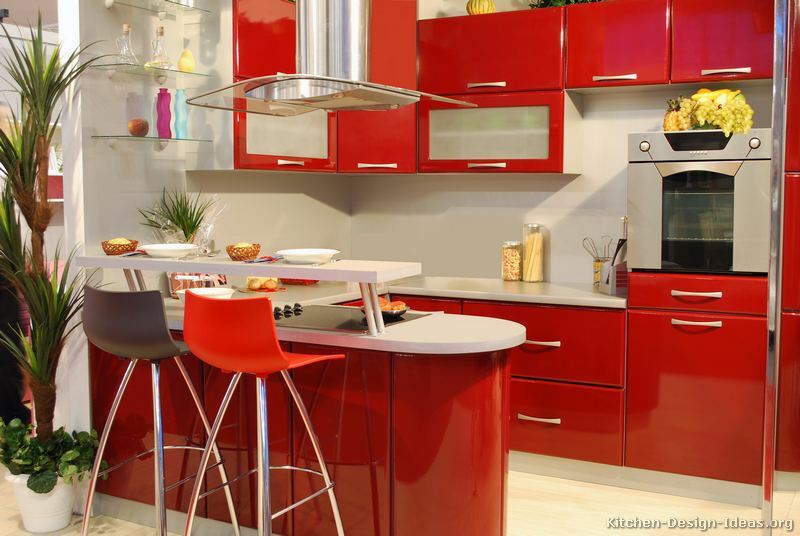 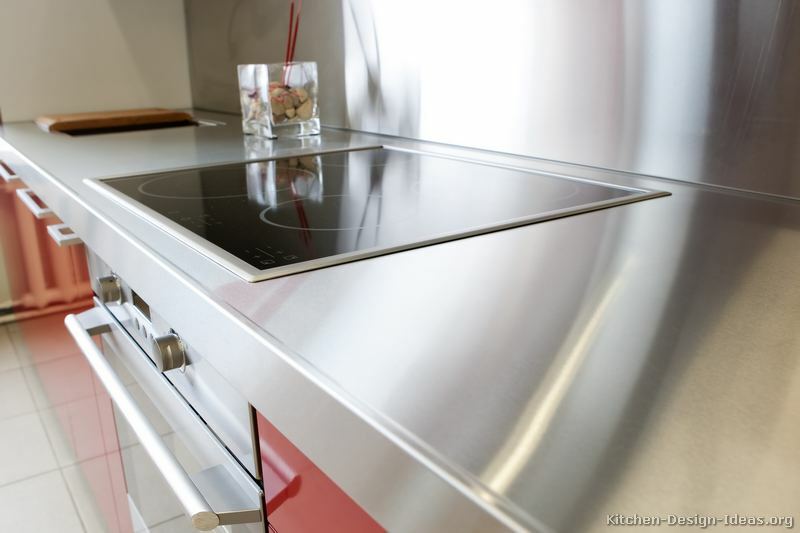 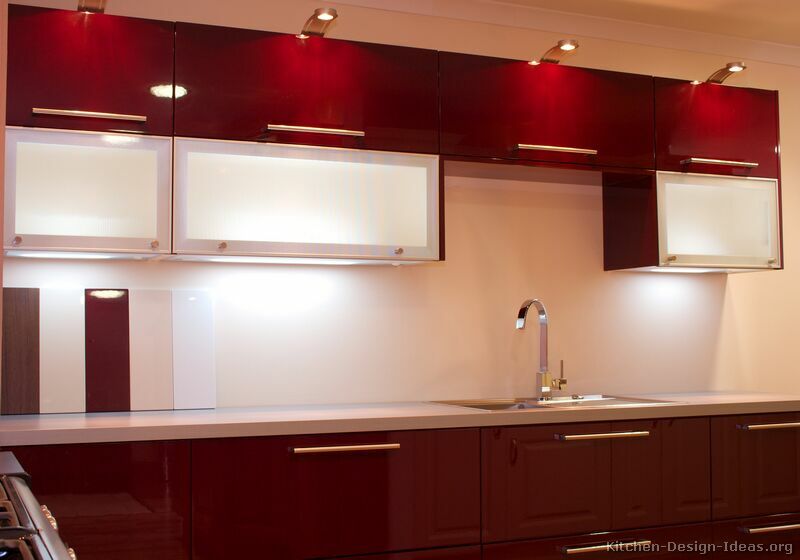 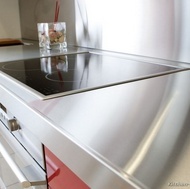 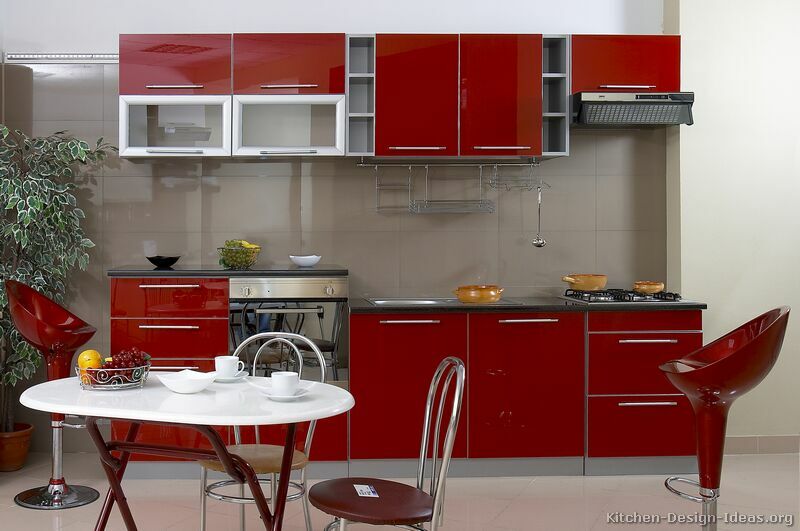 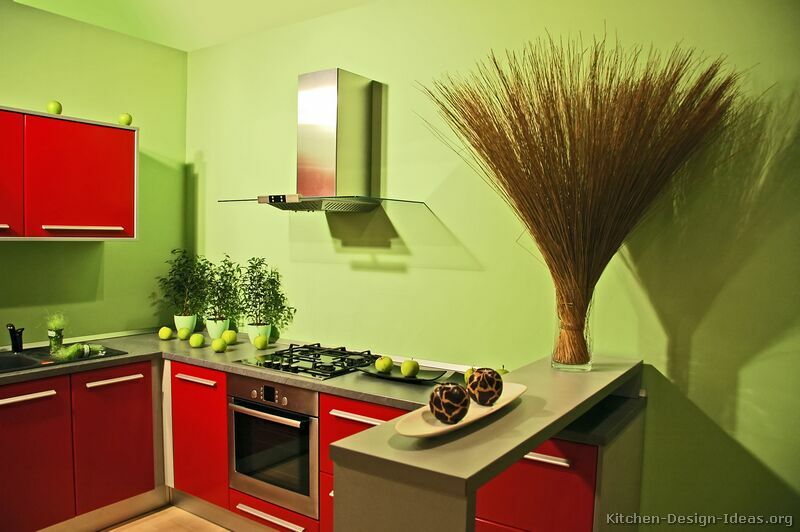 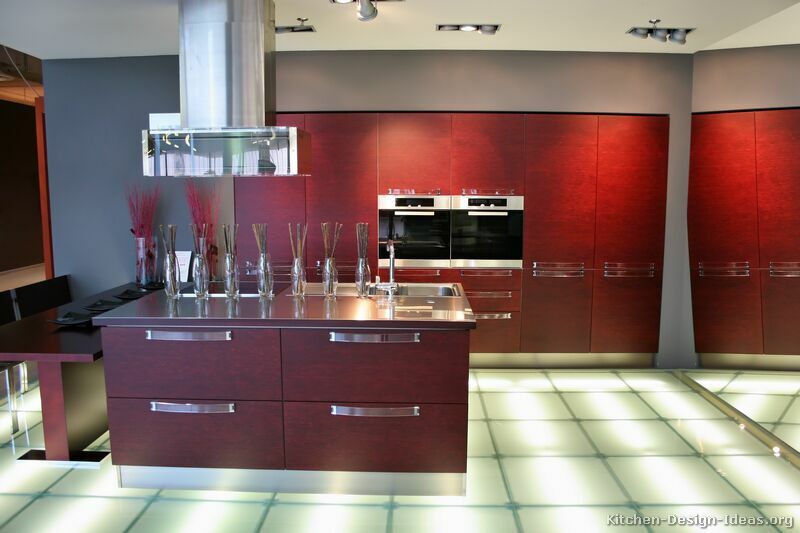 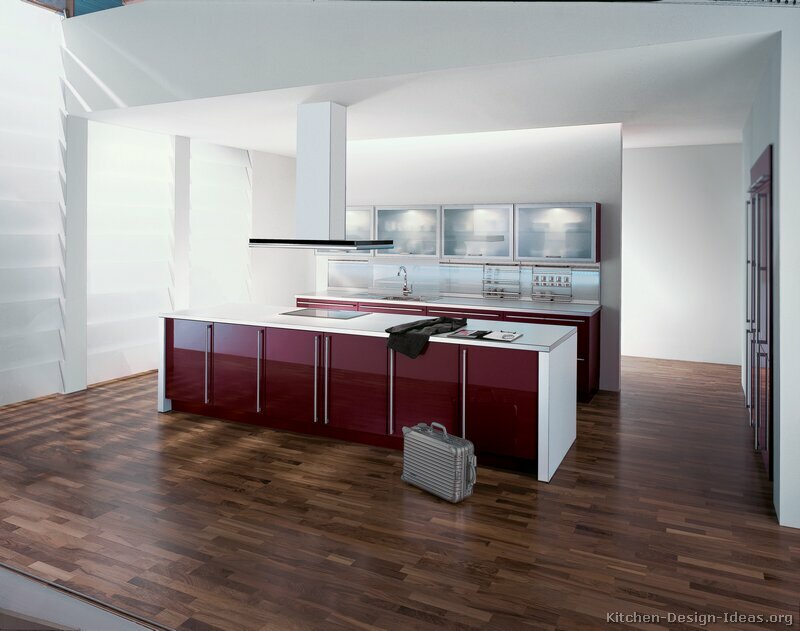 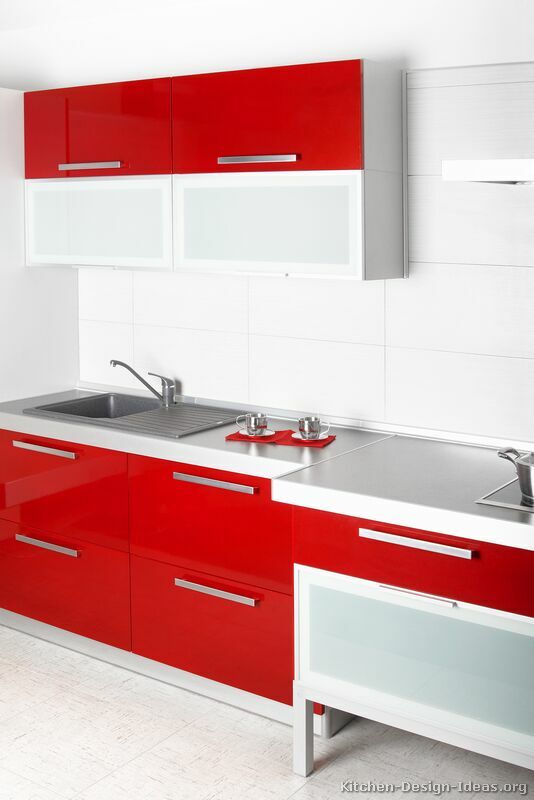 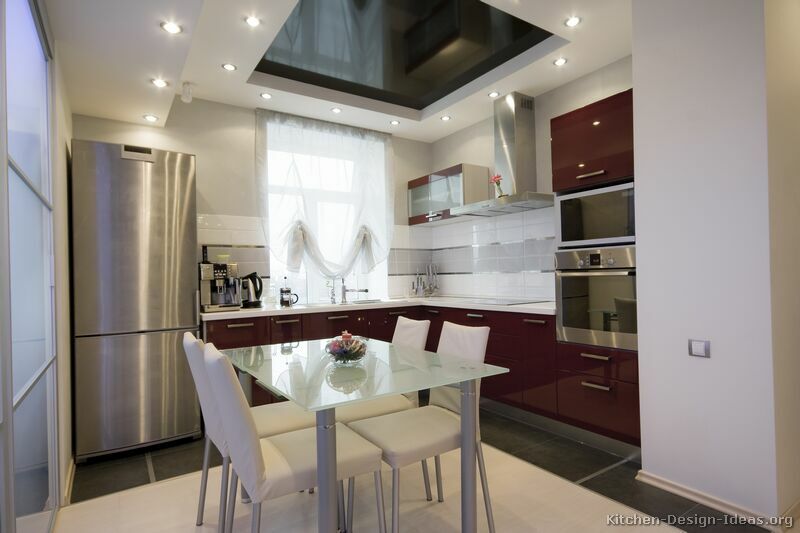 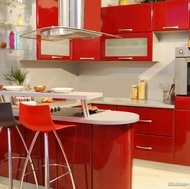 Modern red kitchens mix fashion with passion, and are surprisingly popular in modern homes. 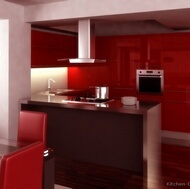 Red Kitchens - Setting the Mood: Red beckons for our attention like no other color. 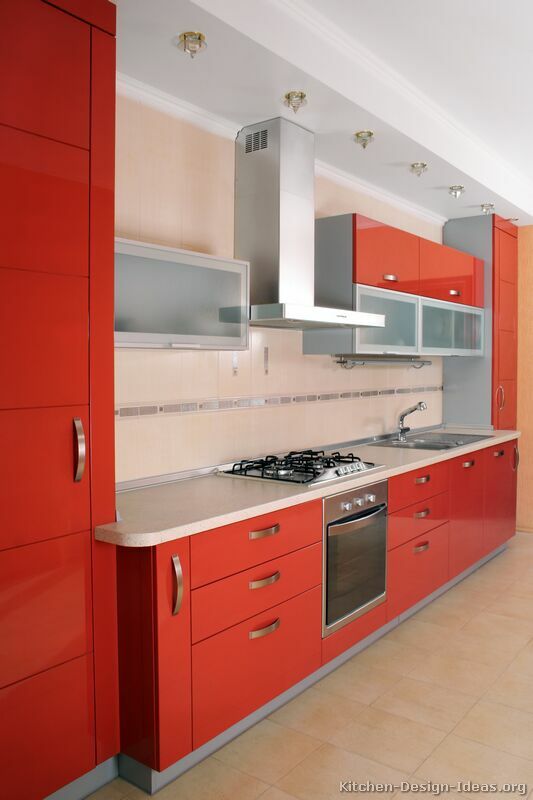 As the most energetic color in the spectrum, red reminds us of love and desire, speed and strength. 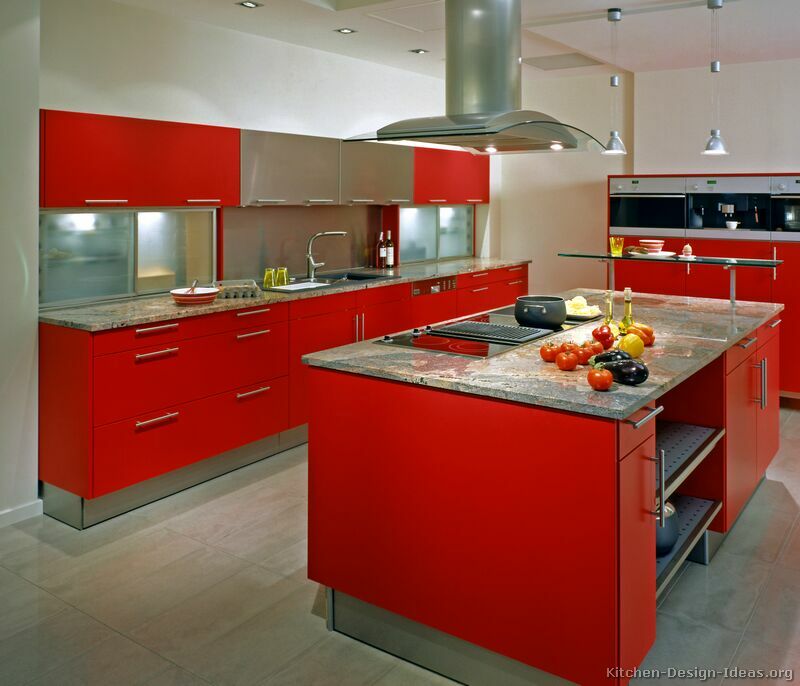 Like a bull-fighter's cape, red is thought to raise blood pressure and make the heart beat faster. 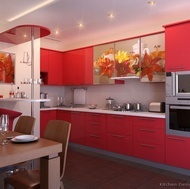 In certain settings, however, red can be elegant and nostalgic as well. 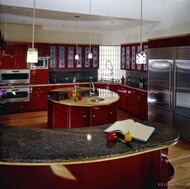 Combined with golden hues, deeper red makes for a rich and elegant setting. 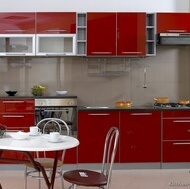 Add a little chrome, and you'll have a more retro or nostalgic appearance. 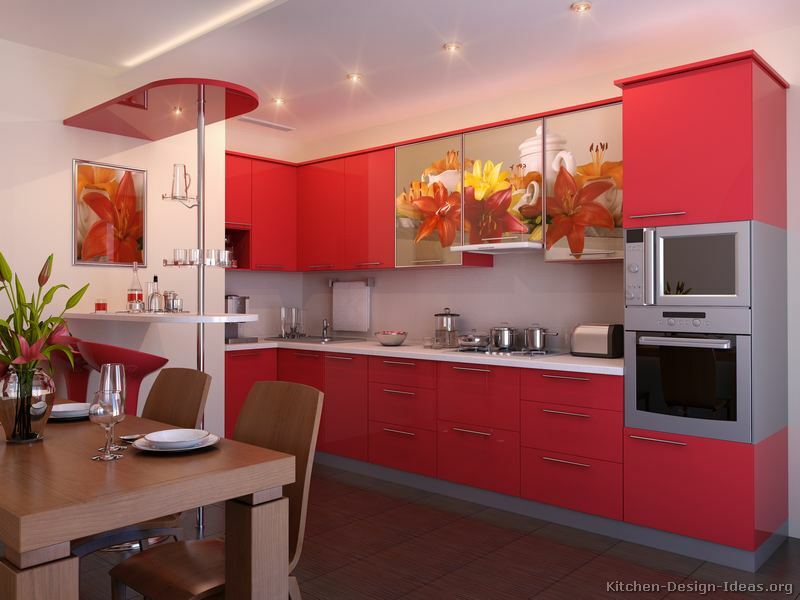 Brighter reds set a more energetic mood. 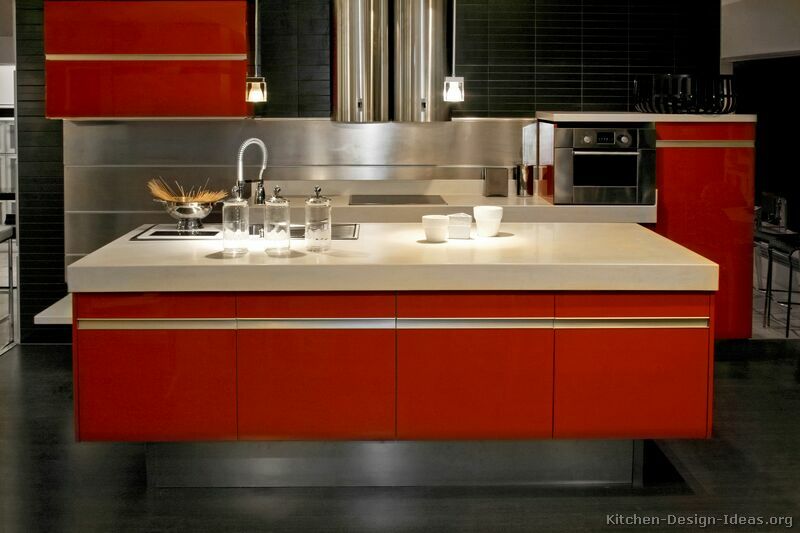 Depending on how you use it, red can add a sense of heat and interest to your modern kitchen design. 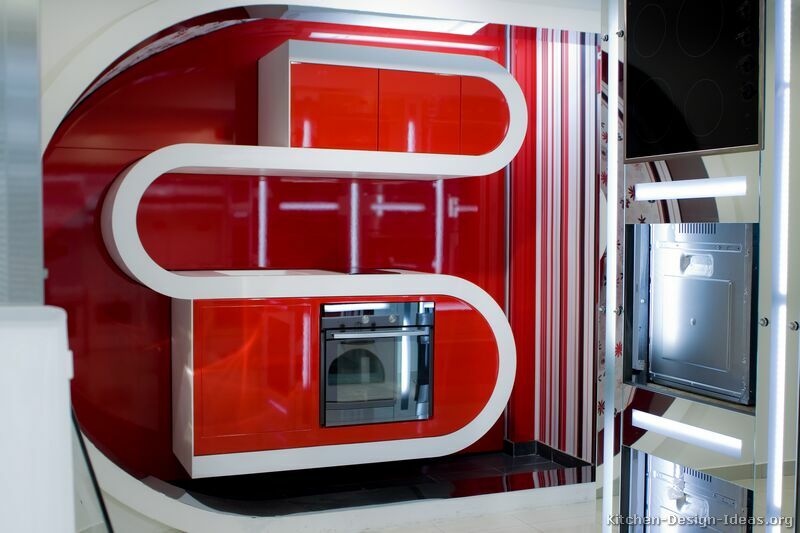 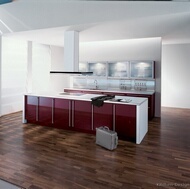 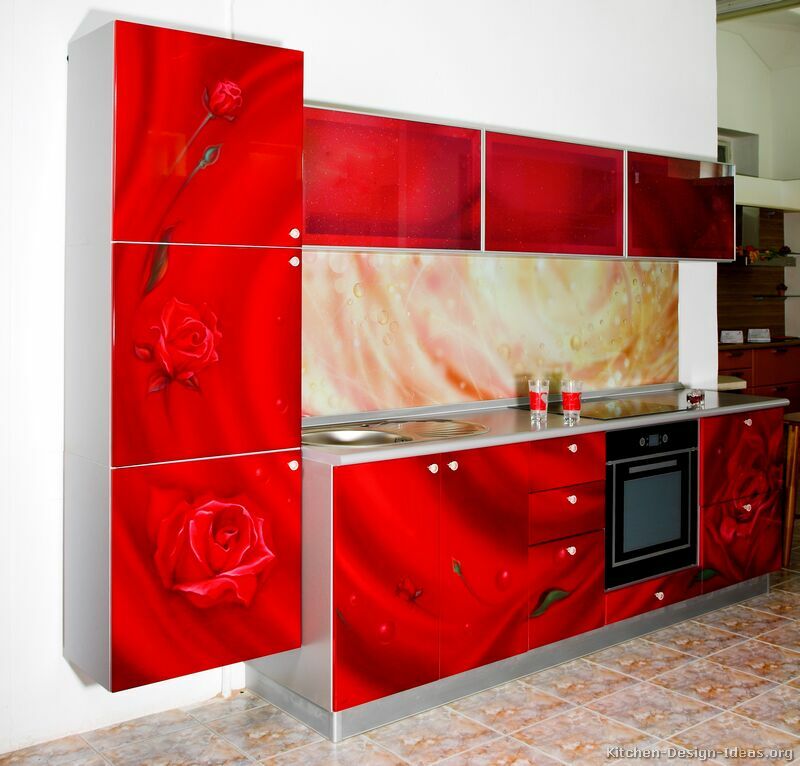 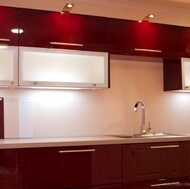 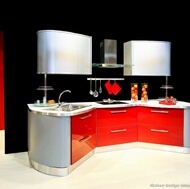 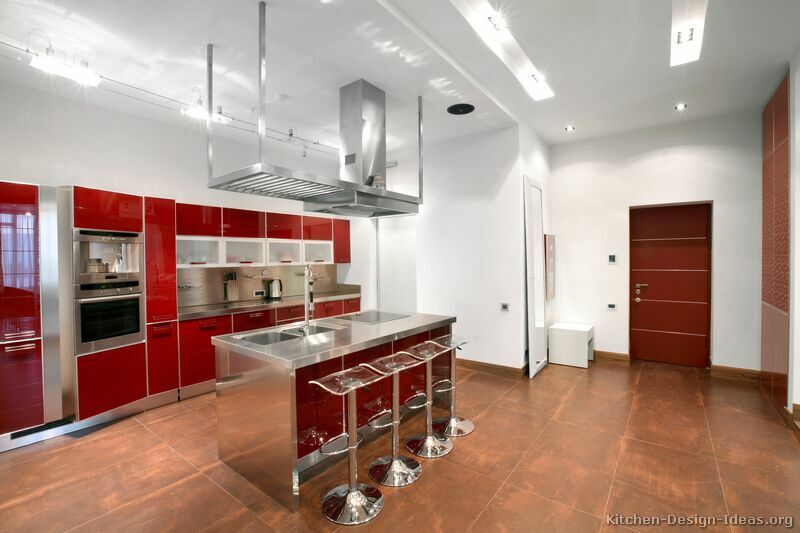 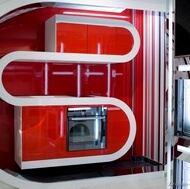 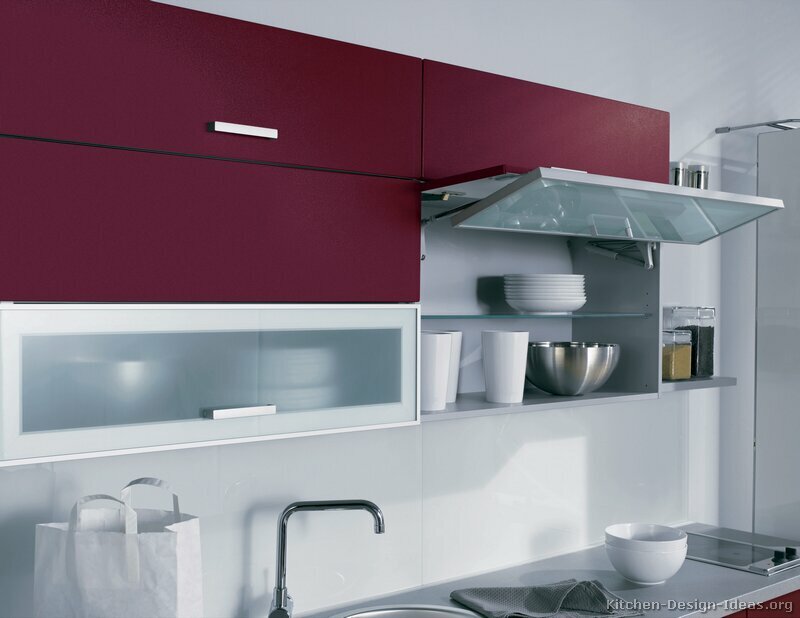 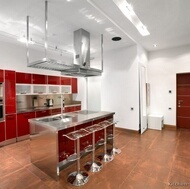 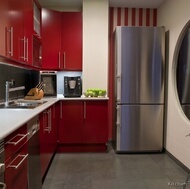 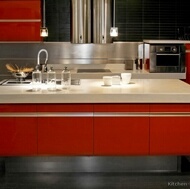 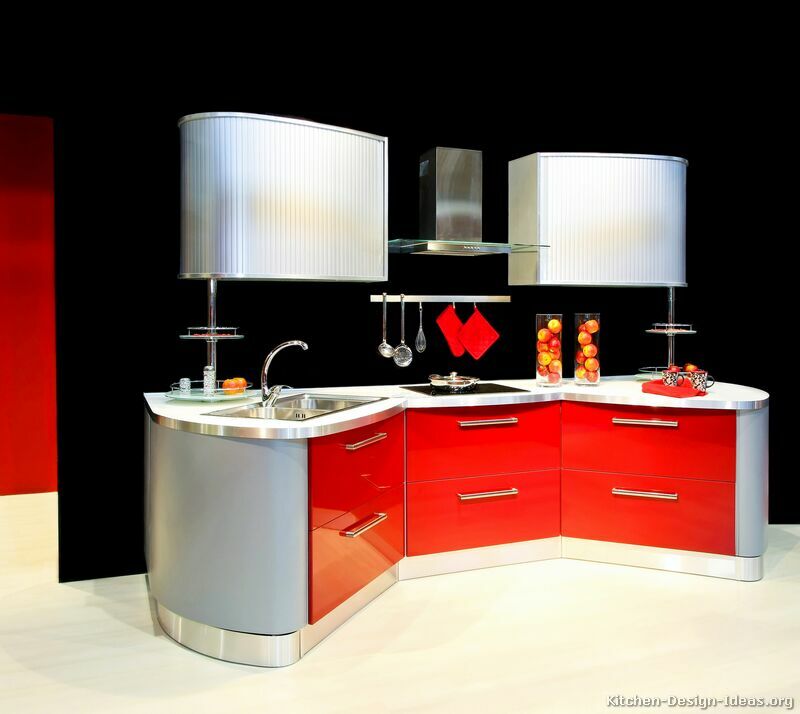 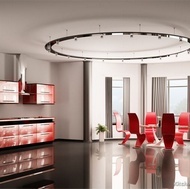 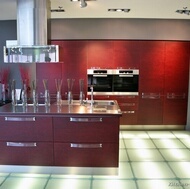 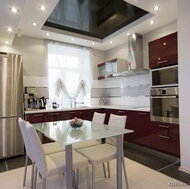 Red Kitchens - Trends: In various forms, red can be either trendy or elegant. 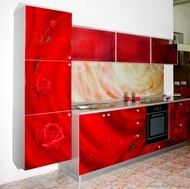 Red can add a sense of romance and pizazz to the otherwise stark contemporary and modern styles. 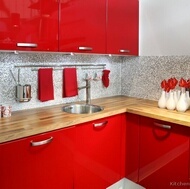 You'll find a plethora of pictures of kitchens featuring red cabinets here, as either the central color or as a contrasting accent in two-tone kitchens. 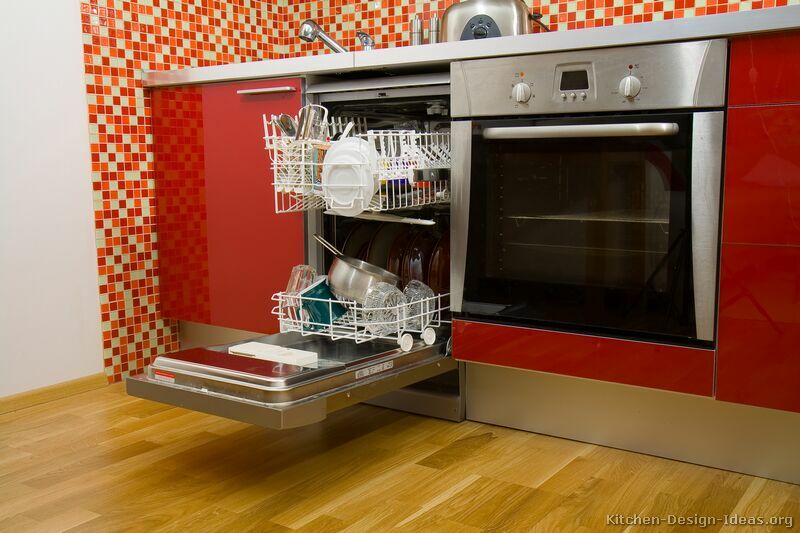 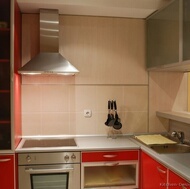 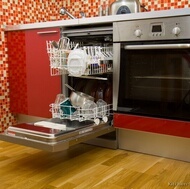 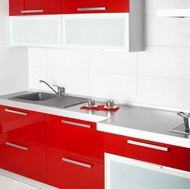 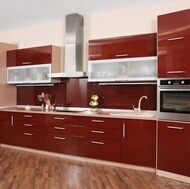 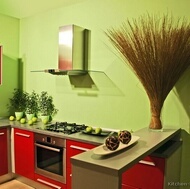 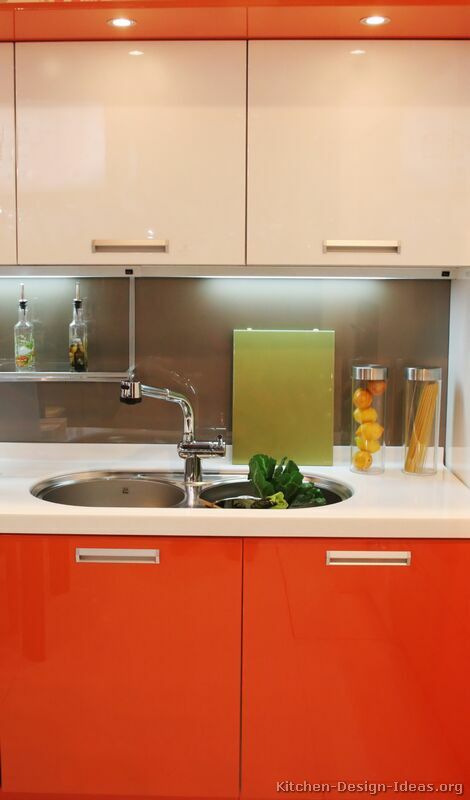 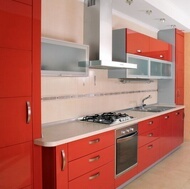 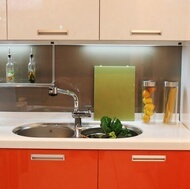 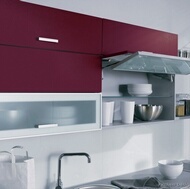 Red Kitchens - Everyday Use: Red cabinets require a moderate level of care and attention. 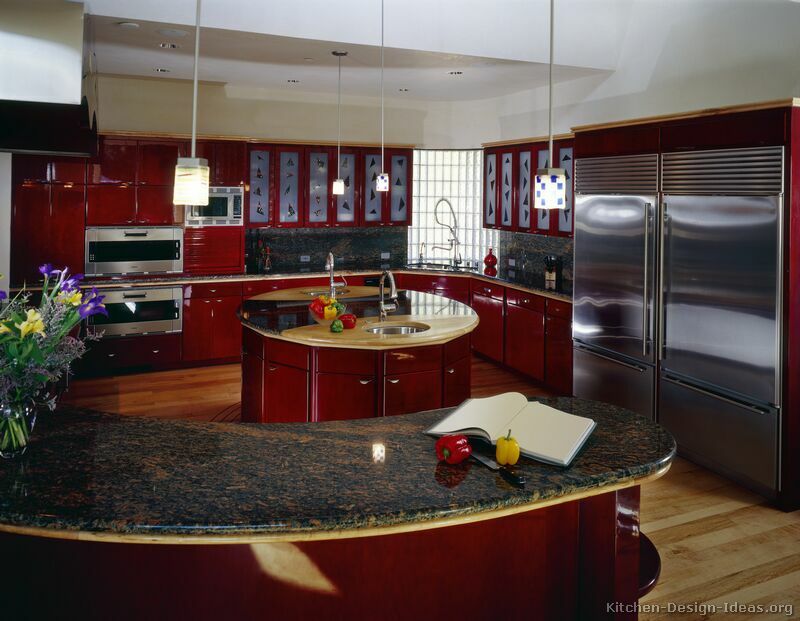 Since dust stands out visually on dark surfaces, deep red kitchen cabinets may require more frequent gentle cleaning and dusting than mid-toned cabinets. 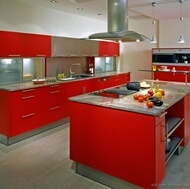 Also, extra work may be required in selecting other colors for the kitchen since reds tend to dominate any color scheme. 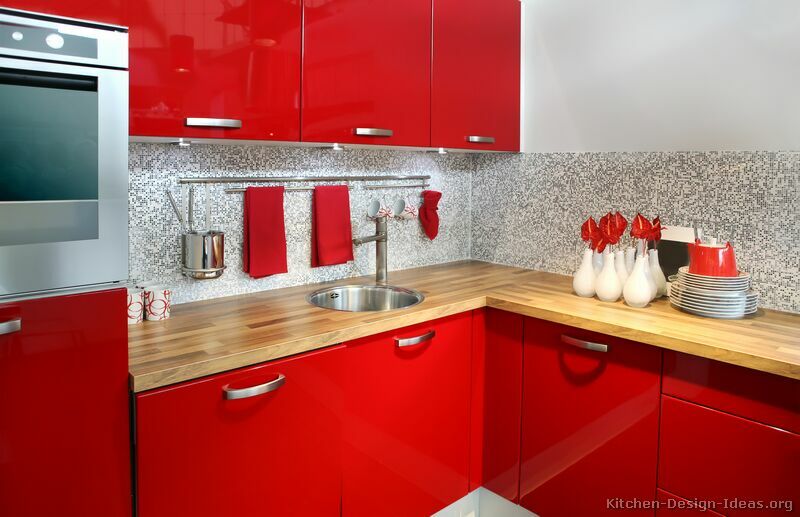 Planning for these practical issues in advance can pay off with a lifetime of enjoyment in your modern red kitchen.